Cheeseburgers: Price is $4.00 for members, $5.00 for non-members. Includes one cheeseburger, chips, and a drink. Additional cheeseburgers are $1.50 each. Pretzel Dogs: Price is $5.00 for members, $6.00 for non-members. Includes one pretzel dog, chips, and a drink. Additional pretzel dogs are $1.50 each. Chicken Tenders and Fries: Price is $5.00 for members, $6.00 for non-members. Includes chicken tenders, french fries, and a drink. What's the best way to recall your elementary school memories? PURCHASE AN SMS YEARBOOK!!! The cost is just $30 and we accept either cash or checks made payable to St. Martha School. Please place your order by Wednesday, May 1st. Unfortunately, late orders cannot be accepted. Be sure to order yours before it's too late! Are you going to Wildwood this summer?Why not help support the SMS safeties while having fun in the sun??? 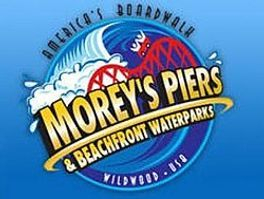 The safeties will be selling wristbands for Morey's Piers until April 28th. They will be selling combo passes, ride passes, and waterpark passes - all at at $10-$13 discount. Passes can be purchased through the Morey's Piers website using our school code. All passes that are purchased will be shipped directly to you and, at the end of the fundraiser, our safeties will receive a check for the proceeds! If you have any questions, please contact Mr. Conard at [email protected]. The fundraiser link is moreyspiers.com/schoolfundraiser and our school code is STMARTHAPA. The yearbook staff is sponsoring a meatball sandwich lunch on Wednesday, May 1st. The price is $4.00 and includes one sandwich, chips, and a drink. Additional sandwiches are $2.00 each. Please send cash only in the exact amount as change cannot be given. All orders must be received by Monday, April 29th. St. Martha's Annual Race for Education will take place on Friday, April 26th! We hope you can help, volunteer, and enjoy this wonderful school event. Last year, we raised $8,700. This year, our challenge is to reach $12,000! This year's funds will be used for "Option C" (replacing MSP for 2019-2020), Ballroom Dancing, Math Matters, Reading Olympics, and technology support and supplies for STREAM activities. Parents received an email on March 22nd providing a link to their child's web based donation page. Share your child's donation page via Facebook, Twitter, and social media. Also, use the email and text link on the invitation to reach out to family and friends requesting their support. Donations are made through a secure credit card site. Check in often and follow our progress as we strive to reach and surpass our $12,000 goal! St. Martha School will continue to accept cash and checks for those who do not wish to donate online. Simply send your donation in an envelope marked: Race for Education - School Office. Please include student's name and grade along with donor's name and, if available, email address. We are having a hot dog lunch to celebrate our Race for Education on Friday, April 26th. The cost is $3.00 and includes one hot dog, chips, and a drink. Please send in payment by Tuesday, April 23rd, and mark the envelope "Race for Education Special Lunch." Cash only please! Thank you for all you do to support St. Martha Parish School! Prizes are generously donated each year by Bobbie Harrison in loving memory of her husband, Bill Harrison. Winners will be drawn from three separate ticket pools. The cost is $10 per raffle ticket. The tuition credit prize is good for ANY Catholic school in the Philadelphia area. The scrip credit prize is for scrip purchases made through St. Martha Scrip Office ONLY. Winners need not be present to win. If interested in purchasing raffle tickets, please contact Maria Gilbert at 215-632-0320. Thank you for supporting the St. Martha Auction! St. Martha's 8th Annual Auction will be held on Saturday, May 11th. Doors open at 6:00 PM. Tickets are $25 each and include catered food from Esposito's Porchetta, beer, wine, soda, water, desserts, snacks, and a FULL SHEET of basket tickets (25 tickets per sheet)! The event will have live and silent auction items, raffle tickets in honor of Bill Harrison worth $1,000 each, 50/50 tickets, the famous Heads or Tails game, raffle baskets, and more! Please contact Maria Gilbert at 215-632-0320 if you'd like to attend. Please remember that the auction committee welcomes any and all donations! Each year our generous parishioners contribute to the success of our auction. This year, we are asking for bottles of wine or spirits. Gift cards to restaurants, movie tickets, or Visa gift cards would help tremendously. If you own a business and would like to donate a service or product, we would love to add you to our list of valued donors. Our donation box is located in the back of the church. Gift cards can be dropped off at the Scrip Office. Thank you for your generosity! Welcome to First Grade with $1,000 off Your Tuition! Do you have a child entering first grade in September 2019? Enroll them in St. Martha Parish School and receive $1,000 off your tuition! This generous grant is being offered by Faith in Foundation for any child entering first grade in September, including those currently attending Kindergarten at St. Martha Parish School. Got twins? Get $2,000 off their tuition. Call now to tour our school and register! Contact Maria Gilbert at 215-632-0320 for details. Continuing for the 2019-2020 school year!!! We are offering school families a $500 tuition credit for successfully referring new students to our school! For more information, contact Maria Gilbert at 215-632-0320.